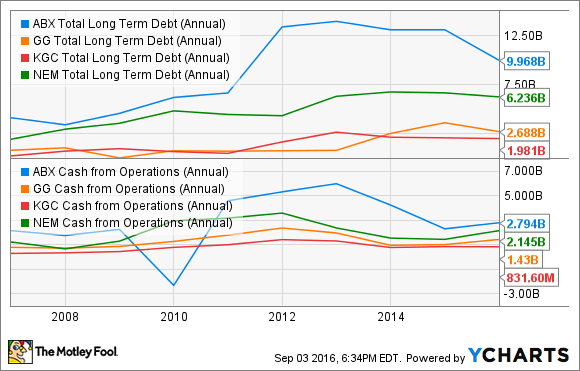 Has Barrick Gold Earned a Clean Bill of Financial Health? It's time for a financial check-up. Does this company deserve a slap on the wrist or a pat on the back? With the price of gold up more than 24% year to date, many investors are considering gold-mining stocks, such as Barrick Gold (NYSE:GOLD) a global leader in the gold-mining industry. Let's give the company a thorough look to see how management has fared in navigating the company through a challenging, volatile market. 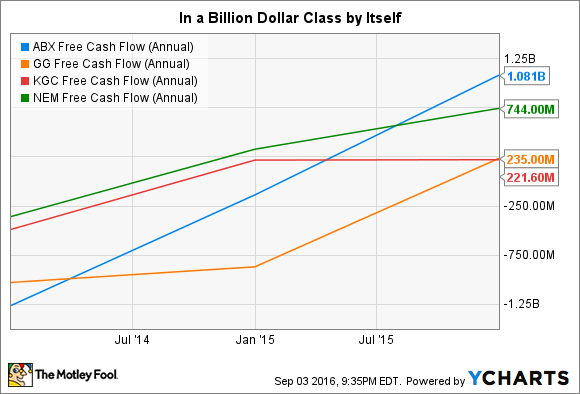 We'll grade the company on three axes: income, cash flow, and debt. To state the obvious, the first positive sign of Barrick Gold's financial health would be steady top-line growth. This sign is nowhere to be seen. Barrick Gold, like its peers, has suffered from 2012 through 2016, following the drop in the price of gold. Not all gold companies have experienced the same difficulty. In 2015, Goldcorp (NYSE:GG) and Newmont Mining Corp. (NYSE:NEM), for example, reported upticks in revenue. Though Kinross Gold (NYSE:KGC) failed to do the same, its decline in revenue was not as steep as the decline in the price of gold. Barrick Gold, on the other hand, is the only company whose decline in revenue exceeded that of the decline in the price of gold -- not a good sign. 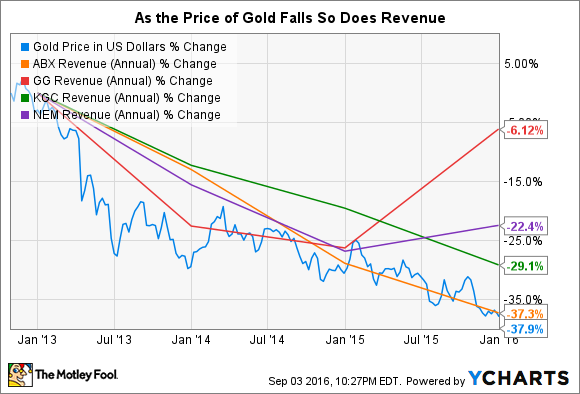 But the decrease in revenue isn't solely attributable to the price of gold. The company reported a 2% decrease, compared to 2014, in gold production at three of its mines: Pueblo Viejo, Lagunas Norte, and Veladero. In addition, Barrick Gold completed several divestitures in 2015 which led to the decrease in revenue. These divested sites accounted for 135,000 ounces of gold production in 2014. Data sources: Barrick Gold corporate presentation, Goldcorp annual report 2015, Kinross Gold annual report 2015, Newmont Mining Corp. corporate presentation. Whereas Goldcorp's management foresees stable AISC costs, and Newmont Mining Corp.'s management expects its AISC to eventually rise, Barrick Gold's management expects continued improvement. Though it's not an acceptable substitute for the lack of revenue growth, management's ability -- should it meet its forecast -- to continually reduce its expenses is a silver lining of sorts. So far, the company's health seems mediocre. Let's see how its balance sheet figures in. Struggling to generate adequate operational cash flow -- much more than its peers -- Barrick Gold weighed itself down in debt several years ago to keep its drills digging away. 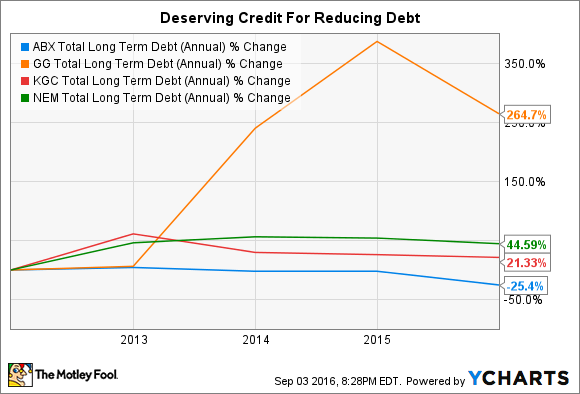 To its credit, management has adopted an aggressive approach toward reducing its debt load. At the beginning of 2015, management set a debt-reduction target of $3 billion, which it achieved, effectively reducing its total debt by 24% during the period. That's an accomplishment its peers are far from sharing. Aiming to continue the lessening of its load, management set a debt reduction target of $2 billion for 2016. As of the end of the second quarter, the company is about halfway toward its goal, reducing its total debt by $948 million over the past six months. As a result of management's success in reaching its debt reduction targets, the company is well positioned for the future. Barrick Gold has only $150 million due before the start of 2018, while $5 billion of its $9 billion in debt is due after 2032. Having nearly finished this checkup, we've found reasons to be both concerned and hopeful. Now let's turn to the company's cash flow. On one hand, there's cause for concern. According to Morningstar, the company reported $2.79 billion in operational cash flow for fiscal 2015 -- a whopping 48% less than the $5.44 billion it reported in 2012. But that's only part of the story. During the same period, management proved to be quite effective at reducing its capital expenditure spending. Whereas capex totaled $6.37 billion in 2012, it amounted to only $1.71 billion in 2015. In fairness, the suggestion that management was "quite effective" is an understatement. Barrick Gold's management was, arguably, the most effective among its peers, resulting in the greatest free cash flow turnaround from 2013 to 2015. Although Barrick Gold has improved considerably in terms of its liquidity, not everyone is convinced that the company is out of the woods. During 2015, both Moody's and S&P downgraded Barrick Gold's long-term debt to their lowest investment-grade ratings: Baa3 and BBB-, respectively. There have been no further changes in ratings during 2016, though. Although Barrick Gold's inability to grow revenue is of obvious concern, the company receives a passing bill of health -- in large part because of management's success at reducing the company's debt, a key factor in driving the company's free cash flow growth. In fact, according to management, the company's $4.1 billion reduction in debt over the past 18 months has yielded improved finance costs -- a reduction in annualized payments of about $185 million. Moving forward, investors should closely monitor the company's upcoming earnings reports to see if it's growing revenue in line with the rise in the price of gold. In addition, investors should keep an eye on whether management is continuing to achieve its debt-reduction targets. Lastly, investors should look for the company's investment rating, which, should it be reduced further, would be a clear red flag.